As a landlord, you may deal with problem tenants once or twice in your property's lifetime. If the way you screen tenants is poor it could happen more often than that. However, these problems all have a solution, even if that means performing an eviction to reclaim your property. In an ever-connected world like ours where a camera is always recording or someone with a cellphone only several feet away, setting fire to your own Leander rental property isn't the best idea. Well, that's exactly what this landlord in Leander, Texas did. Fed up with his tenants and their inability to pay he set fire to his rental home with tiki torches while the tenants were inside. Below is the video provided From Austin's KXAN news network. With many remedies to problem tenants occupying your property - setting fire to it while they are inside is not one of them. There are services in greater Austin that offer help to self-managing landlords such as Texas Tenant Evictions. They provide an eviction service in Austin and the surrounding areas to those without a property manager. This is just one of the many resources available to you as a self-managing owner of rental property in greater Austin, Texas. In the event your tired of dealing with tenants and you'd like to avoid prison, our Austin property managers provide a full-service management experience rendering your property a stress-free investment for you. You can learn more about property management services and what to expect under our 'Landlords' tab at the top. Let’s imagine you just closed on your first investment property. You’re feeling great about acquiring assets and building your real estate portfolio. Your plan is to get your property ready for use and place a tenant as quickly as possible. Wait.. do you even know how much your property is going to rent for? You might have worked with a Realtor when purchasing this home, and since you knew it would be an investment you could have had them run the comps for letting you know what you might get from your investment every month before you even purchased the property. What if you didn’t though? Just look around online and see what you find and slap a price on it? Not so fast! Everyone has an idea what they want out of their rental property every single month, but is it justified? Price your rental to low and then you’re stuck receiving less than market rate on your investment. Price yourself to high and you’re property could sit there vacant with you floating the payment every month. There’s a process to accurately pricing your rental so that you receive the most money possible every month it’s occupied. Be wary of using the large real estate websites such as Zillow, Trulia, etc. These are large companies who work nationwide and sometimes their data is inaccurate for sales history and price points. 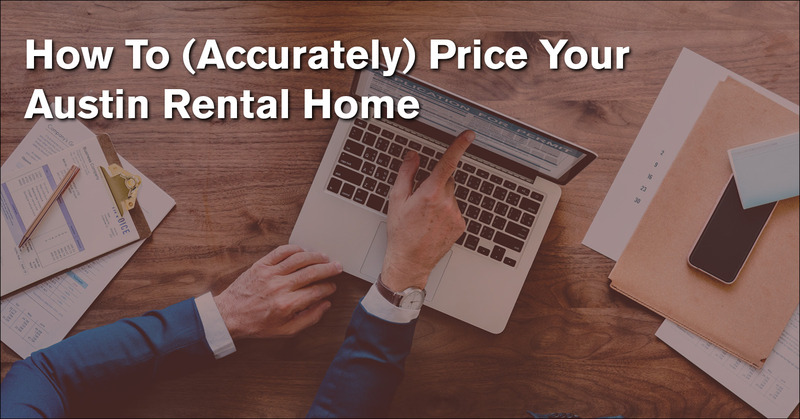 This can lead to you doing an analysis with incorrect info, leaving you with an inaccurate price for your Austin rental property. Your best bet is to work with a professional in the area on pricing your rental. Property Managers and Realtors will have access to the local MLS and be able to see comparable properties and their rental history in the neighborhood your rental is located. Our Austin property management experts have been working in the various regions of Austin for over a decade. After learning your properties address, we analyze the market rents from the past several years on all the properties in your rental home’s location. We compare your properties offerings – square footage, washer/dryer, appliances, year built, etc – to accurately determine the highest price point that your Austin rental home will rent for. The best part is that we offer this service completely free to any property owner curious about what their property will rent for. In just under half an owner we can provide you with a detailed report and comparable properties justifying our take on your property’s rental rate. Curious what your Austin rental home will rent for? Receive a free rental market analysis from our team at Stone Oak today! Just provide us some details or give us a call via 512.617.6766! 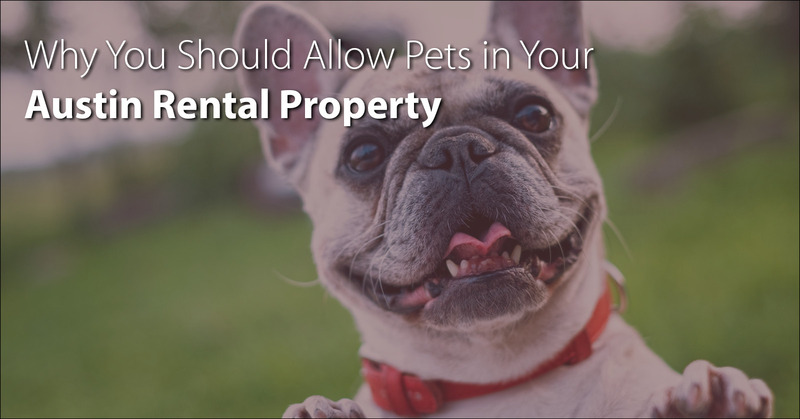 If you own or are considering purchasing a rental property in Austin, Texas there will come a time when you have to decide to either allow or not allow pets to live in the property with your tenants. This decision can be an important one. Yes they can cause damage, but so can tenants and they are what makes your property profitable. In cities like Austin where the majority of businesses are considered ‘pet-friendly’, not allowing pets in your property can harm you in many areas of owning a rental property. The rent money that comes in every single month is what makes this all worth it, and increasing this number is always a priority of you, the owner. Sure, a typical renewal will come with a standard 2% increase to rent amount every single year, but allowing pets is a sure fire way to increase your rental rate right now. With the inclusion of pets at your property this will allow you to collect a pet deposit and pet rent. Even at $30/mo, this pet rent could add up to $360 in extra income every single year! Allowing tenants with pets in your property plays a huge role in expanding the pool of potential tenants for your property. The more potential tenants your property has the faster it leases which means the faster you start earning passive income from your rental property. In fact, according to a survey more than 75% of renters own a pet. The majority of these renters report that they struggle to find pet-friendly rental homes. In a city of renters like Austin, your home will be a beacon of light to pet owners looking for a place to rent! Across the nation vacancy rates are down, which creates competition amongst properties for rent-paying tenants. Tack this on top of the low number of pet-friendly rentals and your pet owning renter will be more likely to renew with your property once their lease term is up. Turnover from tenants and vacancy can turn your profitable investment into a money pit. In fact, according to FIREPAW, INC, tenants with pets stay in a property an average of 8 months longer! Maybe now you’re considering allowing pets in your Austin rental, or maybe you just don’t believe us about how pet-friendly Austin is. One trip to Zilker Park on Saturday will change your mind! If you’d like to start accepting pets it’s great idea to have a pet policy that’s clearly and concisely written in your lease agreement. It will provide the foundation for charging more rent for pets, collecting pet fees and anything pertinent to your tenant’s furry friend. Talk to a Austin property manager today to speak with someone about allowing pets in your rental property! We talk to many owners and investors in the Austin area who have interest in property management for their properties in the Austin, Texas region. Everyone is in search of different levels of service and one owner may have needs that another doesn’t. Property management companies are pretty adaptable and can work with the landlords to customer tailor their services to their needs. There is no denying Austin is a rental city with hordes of real estate investors flocking to the region for the past two decades. The majority of these investors are going to be located out of state and require a more hands-on property manager than those who are local owners. As an owner of rental properties located elsewhere, what should you expect from an Austin property manager? Below we review the A to Z of Austin Property Management! When you own a rental property your favorite word is ‘rent’. It’s the stuff that keeps coming every month that makes your rental property a passive income asset. So when it comes to the rent for your property, what are a manager’s responsibilities? Setting Your Rental Rate: Calculating the rental amount for your property is more than just slapping a number on it and hoping it sticks and someone pays it. A multitude of outside factors are considered when determining this amount: location, comparable properties, school districts, historical prices, timing, etc. Your chosen Austin property manager should be keen on pricing your property just right! If you over price the property, your listing will be stale and the traffic will go elsewhere. Under price your unit and the next 12 months might not be your most profitable months. Curious what your Austin rental home will rent for? Receive a free rental property analysis from our Austin market expert! Collecting Your Rent: The Austin property management company you chose to work with is important! The manager you choose should be a trustworthy one as they will be responsible for collecting money and dispersing it to you every single month. If your manager hasn’t integrated the latest technology into their brokerage this can turn into a headache fast. You should elect to work with an Austin property manager who collects rent from your tenant(s) online. If they utilize a software like AppFolio, you’ll always be able to login to an owner portal and check the status of payments and balances! Adjusting the Rental Rate: Don’t forget about inflation and appreciation! Typically, property managers will follow a strict guideline for increasing the rental rate on your home every year. A 3-5% increase in rent every year is standard. However, tenant relationships are important and can sway this decision. For example, let’s imagine you’ve had the same tenants for the past 5 years and they are beginning to get priced out of your home. Is it worth it to keep raising their rent and force them out when you know they are reliable and pay on time every single month? These are factors to consider when deciding to raise the amount of rent on your Austin rental home. What about when the tenants fail to pay the rent on time? You’ll be happy you’ve partnered with an experienced Austin property manager! From enforcing late fees to completely evicting the individual from your property, you’ll rest assured that it’s a headache you don’t have to be the owner of. When we use the term rent, we are referring to your money. Be sure to hire an Austin property manager you can trust, not just the cheapest option! The lifeblood of your Austin rental home: tenants. What should you expect from your Austin property manager when it comes to tenants for your property? Marketing Your Property: Vacancies are the true enemy here! When your property is vacant you aren’t earning money. If you hired just the average property manager you might even still be paying them during this vacancy… Finding tenants for your property is a tall task and your Austin property manager should be up to the job! Be sure to ask any manager you are considering what their process for marketing is. If they give you the same old spiel about listing it on the MLS you may not be getting the exposure your property deserves. Are they providing tenants with a virtual walk though to tour your property from their phone? Do they have established social media channels, like a Youtube channel for available Austin rental homes? Stone Oak Property Management has an in-house marketing team whom hold certifications with Google, Facebook and other digital marketing suites that we utilize to get your property the exposure it deserves! Screening Tenants: The Austin property manager you choose to work with should have a rigorous and consistent screening process for any tenant interested in your rental home. This can include background checks, credit checks, database checking and much more. Austin is a big city and if your property manager is experienced they should have experience with handling thousands of tenant applications and screening them so that the best tenant for your property is selected. You should end up with a tenant who pays rent on time, usually stay for a longer tenancy and overall create fewer problems for you and the management company. Leases and Legal Documents: Too often we speak with owner’s who managed by themselves and used a lease document that didn’t have the necessary addenda and clauses to protect the owner. When dealing with an Austin property manager, their lease should be bulletproof and include any and all major clauses that offer protection to the owner of the property. Move Outs: At the end of the lease, your property manager is responsible for ensuring the tenants are actually gone, inspecting the unit for damages, and determining the amount to be deducted from the initial security deposit if any. After that, you’re manager should quickly have your home rent ready after making and necessary repairs to the property. Evictions: Your property manager should be well versed in the process of doing so and at the same time rarely have to perform them. They should be able to handle the entire process from notices to writ of possession without ever involving you. When interviewing potential Austin property management companies, ask how many evictions they’ve had in the past 12 months. If any, this could speak negatively about their tenant screening process. Stone Oak Property Management hasn’t had to do an eviction for any of the properties we manage since 2016, but we do offer an Austin eviction service for self-managing owners and those who need help! It’s your property manager’s responsibility to keep your Austin rental home safe, inhabitable, and up to code! Maintenance: Your Austin property manager should perform preventative property maintenance to keep your property functioning correctly. They should have a team dedicated to addressing maintenance issues for your tenants with the goal of keeping your current tenants happy and attracting new, quality tenants. Repairs: For any repairs to your property, your manager will have a reserve account on file for you set to a certain monetary amount. For example, Stone Oak keeps $300 of our owner’s money in a trust account. If an issue arises and a repair that is needed costs less than this amount we will proceed with the repair without consulting with you, the owner. If the repair cost totals more than $300, we will contact you before proceeding with the repair. With that said, your Austin property manager should have an established network of vendors and tradesman they regularly work with at discounted rates. Any repairs done on your rental should cost less than if you were to contact the same service for your personal home! Stone Oak has vendor relationships from which you benefit from due to the bulk work we can provide to these vendors! Choosing an Austin property management company with great organizations skills can make your life easy! Track Records: Your manager should accurately keep records on all things concerning your Austin rental property. For example, Stone Oak Management uses AppFolio as our management software and it does wonders with putting our records together for you! Our owners can login via our website at anytime and check expenses for their property and track exactly what we are doing with their property! Property Taxes: Your Austin property manager should assist you in understanding how to file taxes for your investment property. Property taxes seem a bit high? Our Austin property management company will even protest your property taxes with tax assessor’s office! Who you choose to manage your Austin rental property matters. You’re essentially hiring a third party that will act as an extension of you to your tenant’s, vendors, etc so make sure you can trust them! There is no shortage of Austin property management companies so be sure to shop around and talk to as many different sources as you can and address the different points from this article. Your Austin rental property is a valuable asset that will benefit from having the right systems in place for it to thrive!